A satellite photograph of Portsmouth in the 21st Century shows it to be very largely covered in buildings with only a few isolated patches of green. It is still possible though to trace the outline of earlier forms of land usage thanks to the continued use of the original routes between fields for the modern roads. 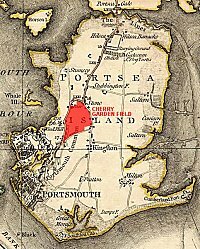 One such area was Cherry Garden Field (see right, in red) which until the 1820s was still almost entirely agricultural land. The name itself has all but disappeared from the collective local memory as unlike some other areas it's name has not been passed down for use as a road or street name. Cherry Garden Field was also known as Metland, Maitland (a name that has survived) or Mateland Field and was one of the Common Fields of the Borough. 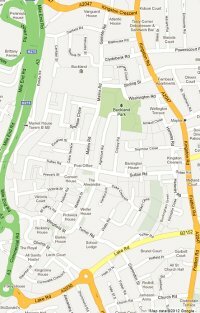 It occupied most of the space bounded on the west by Commercial Road/Mile End Road, on the south by Lake Road, east by Fratton Road/Kingston Road and north by Kingston Crescent. As an ancient common field it was, until the middle of 18C, farmed in common by a large number of joint proprietors who were, by the beginning of the 19C, absolute owners of their piece of land. The field was divided into several Furlongs, which were sub-divided into strips or Rods. The Furlongs all had names that must once have had an historical resonance but which is largely lost today. Names such as Smalden, Middle Shoth, Gusleware or Beggar's Bush would mean nothing to a modern day resident of Buckland, though they might hazard a guess about Drunken Furlong or Lake Lane Furlong. Thanks to a map of the southern end of the field (see left) and Howell's "Topography of Portsmouth" we do actually know where most of these furlong's were located though accurate placement is complicated in that he describes their position in relation to streets which existed in 1913 when the Topography was published but which have subsequently been lost or altered in name or position. 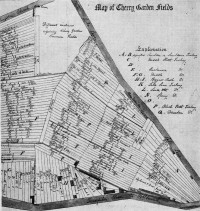 The map of Cherry Garden Field mentioned above is undated but is generally taken to have been made around 1800. 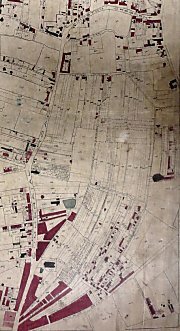 It was certainly drawn before 1828 as it does not include All Saints Church which was completed in that year nor any substantial development around Newtown or in the corner between Commercial Road and Lake Lane. It defines the Furlongs as named by Howell but also shows how each was subdivided into rods and gives us the names of the owners. A high proportion are owned by Lord Powerscourt, Winchester College or the Ridge family and there is much evidence of the deeds being transferred between them and other incomers. Interestingly, in their 'Chronicles of Portsmouth' published in 1828, Henry and Julian Slight tell us that All Saints Church was sited on four strips of land formerly owned by Lord Powerscourt, the College of St. Mary Winchester, Herbert Allen Esq. and Mr. T. Gloge. The map does not confirm this though that is not surprising given the speed at which the ownership of the strips seems to have changed. 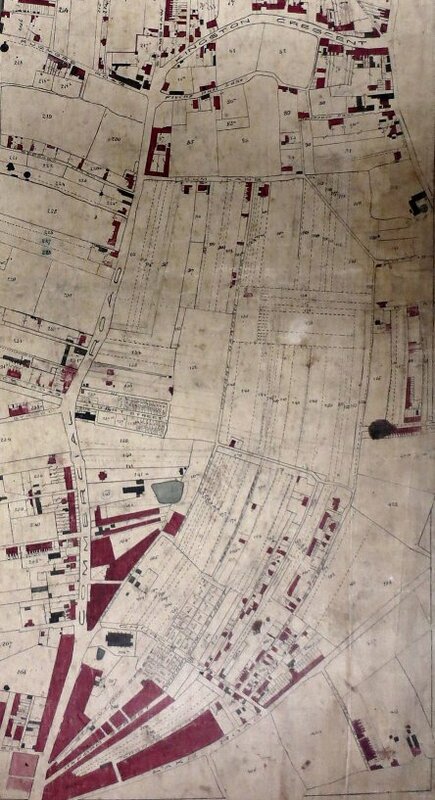 Whilst the map and Howell's book undoubtedly aid our understanding of the development of Cherry Garden Field their importance is overshadowed by the Tithe Map drawn by Thomas Ellis Owen between 1838 and 1845 (see extract, right). 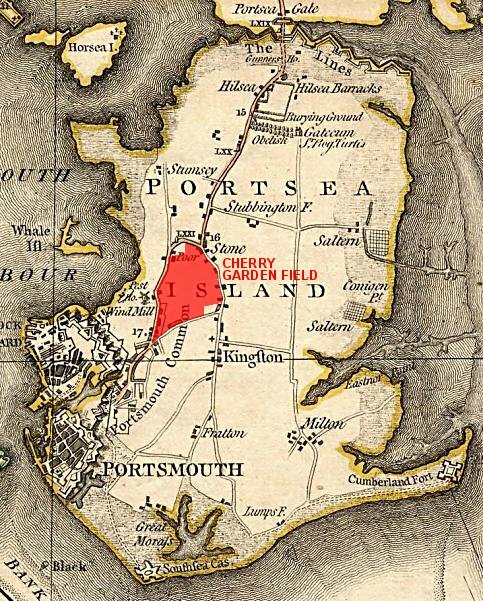 Prepared in part as a response to the 1832 Reform Act, it utilises a detailed numbering system to define every parcel of land in the parish of Portsea. The accompanying Schedule names both the owner of the land and it's occupant as it was in 1845 and also lists the sizes in acres, rods and perches, describes the current usage of the land - arable, meadow, garden, building - plus the tithes, and whether they were payable to the vicar or the improprietor. It must have remained in use for several succeeding decades as there are numerous manuscript amendments, often defining changes of ownership or recording the redemption of the tithe. The Tithe Map and Schedule offers us a snapshot of a moment in history. The legal framework which stimulated the work should have ensured that it was repeated across the whole of England but in practice most Boroughs did not feel the need to use the services of a skilled architect for the work and many did not bother at all. For that reason we can be grateful to Thomas Ellis Owen whose work offers modern historians a rare opportunity to look into the past. We can see that in 1845 Cherry Garden Field was still very largely agricultural, but it also presages the approaching urbanisation. In the south-west corner, between Commercial road and Lake Road lay Oxford Street, Staunton Street and Cosham Street all of which are almost completely covered in buildings, a terrace can be seen spreading along Lake Road and the area in front of Charles Dickens birthplace, which was known as Newtown, was already a sprawling mass of housing. At the north end of the field more buildings can be seen on the south side of Kingston Crescent whilst at the northern end of Commercial Road sits a Poorhouse. Even at this early date we can see how the the new roads are following the lines of the old strips, a process that would continue throughout the rest of the century. 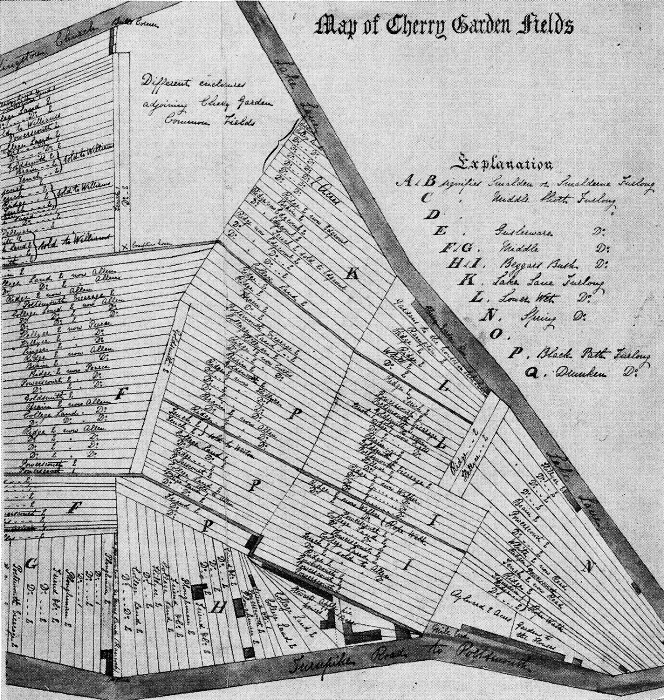 In addition to providing the incentive for Owen to map the parish, the Reform Act also extended the voting franchise which in turn provided a platform for the production of the first electoral rolls. Whilst these are useful historical sources, they are somewhat limited on their own. This is because, firstly, electors were defined as being men who owned or occupied property worth at least £10 and secondly the early lists only gave a broad indication of the location of the property that conferred the right to vote. However, by using the lists of electors in conjunction with the Tithe Map and Schedule we can add further colour to our image of Cherry Garden Field in 1845. The electors lists have another value in that they can give us an idea of when a new road becomes inhabited for the first time, provided of course that there is at least one property worth £10 fronting onto it. In many cases this will only be approximate as many electors simply give the location of their property as 'Buckland' or 'Kingston' and in others we see locations defined as 'New Street, Cherry Garden Field' or 'New Road, Cherry Garden Field' when the newly developed road hadn't yet been given a formal name although it was partially inhabited. In other instances a street is glimpsed in the midst of the development process, such as the scattering of dwellings seen on Hertford Street, in contrast to the density of occupation that existed a few years later. By the early 1880s the process of development had completely transformed Cherry Garden Field. There was barely a patch of open land left. The style of housing was largely flat-fronted, with a few having bay windows, with doors that opened straight onto the street, all with back yards, mostly of a size that would be recognised by residents in the 21C. That there should have been such a rapid expansion in housing from the 1850s onwards is largely a consequence of the growth of the Dockyard, beginning from the mid 1850s when it was realised how underprepared the navy had been in facing the Russian war. We can be confident therefore that many of the occupants of houses on the former Cherry Garden Field worked in the Dockyard and most of the others provided the infrastructure necessary to maintain such a workforce. When they were built, most of the houses must have been thought of as excellent accommodation for the working class families that occupied them, but it is improbable that the builders thought they would last the 100 years which many of them did. In fact the road system and most of the houses survived right up to the onset of the second world war, indeed given that only about 20 bombs fell on the whole area, most of the property emerged unscathed from the war as well. What they would not survive however was the post-war town planners who by the 1970s had razed vast swathes of the original field and replaced it with the new estates that we see in the 21st century. Some houses did survive notably those in the truncated Agincourt, Cressy and Washington Roads. Sadly though the redevelopment obliterated many traces of the original fields and their boundaries but they left enough behind to remind us of those thousand year old strip definitions. We only need to trace the course of Staunton or Church road in the south; Sultan, Malins, Agincourt, Cressy or Wingfield in the middle; Gamble Road and Malthouse Road in the north and mix in those fleetingly remembered names such as Maitland and Flying Bull to recall a time when agriculture ruled over Cherry Garden Field.